Collaborative Art Projects - anti-product. = Art All Sizes. Why working with other artists is almost imperative to growth and learning. When artists come to mutual decisions and work together towards a common creative goal, there is a potential for real, meaningful learning to occur. In a great many ways the elements of experiential learning and cooperation were more important than the finished artworks themselves. In the earliest stages of creation, when a person is trying to come up with an idea for a work—a new medium, a new approach, a new piece of visual art—or attempting to flesh out the bare bones of a rudimentary idea, spending time with friends or intimates who serve as mentors, muses or sounding boards can be invaluable. Being around other artists will frequently stimulate the generation of ideas. It's part of the reason Andy Warhol created his Factory. In 1984 three artists living in New York – Andy Warhol , Jean-Michel Basquiat and Francesco Clemente – engaged in a collective project, working on canvases, two artists at a time or all three together, creating paintings of great visual impact, which constitute an important episode in the context of ‘Eighties painting. ​The successful outcome of these Collaborations stems from a compositional method that recalls that of the “exquisite corpses” used by the Surrealists: each artists paints without knowing what the others are painting. Poster announcing the Warhol/Basquiat collaborations show. ​In just about any way you can think of, Jean-Michel Basquiat and Andy Warhol were very different artists. Yet they had a close and troubled friendship that surprisingly led to a huge body of varied and contradictory paintings that they worked on together. Basquiat had been wanting to meet the famous Warhol since he was in high school, and made several attempts the wary older artist brushed off. But "In the autumn of 1982 I brought Jean-Michel to Andy Warhol in the Factory and this is how they really got to know each other," says their mutual European dealer, Bruno Bischofberger. At that time, the two did portraits of each other. Still, it was not till later that they began painting together. In the mean time, in 1984 Basquiat was visiting Bischofberger in Europe, and worked on a 48 inch square canvas -- Untitled (Pakaderm) -- with Bischofberger's five year old daughter Cora. Bischofberger then initiated a three way collaboration between Warhol, Basquiat, and Italian artist Francesco Clemente. Such collaborative ventures were perhaps best known previously among the Surrealists. For these 1984 collaborations, Bischofberger suggested "every artist should, without conferring with the others about iconography, style, size, technique, etc., independently start the paintings, of course in the knowledge that two further artists would be working on the same canvas, and that enough mental and physical space should be left to accommodate them." Each artist initiated three paintings and one drawing, and the works then traveled on for the other artist's to work on their additions serially and separately in a different order. When this experiment was over, Basquiat and Warhol secretly collaborated on many more canvases of their own in Warhol’s New York studio, "The Factory." Warhol usually started the works, moving from his normal photo silk-screening of appropriated images to hand-painting them with the aid of a projector. As Basquiat described the process to Tamara Davis: "He'd start one, you know, put...something very concrete or recognizable like a newspaper headline or a product logo and I would sort of deface it and then when I would try to get him to work some more on it, you know... We used to paint over each other's stuff all the time"
​Warhol was mostly thrilled with the products, although he once complained in his diary, "[Jean-Michel] painted over a painting that I did, and I don't know if it got better or not." Warhol also stated that the "paintings we're doing together are better when you can't tell who did which parts." In fact the two artist’s styles are obvious in nearly all the works, but they did confusingly swap techniques occasionally, with Warhol painting his flat images, and Basquiat sometimes making silkscreens of his blown up drawings and printing them onto the canvas. 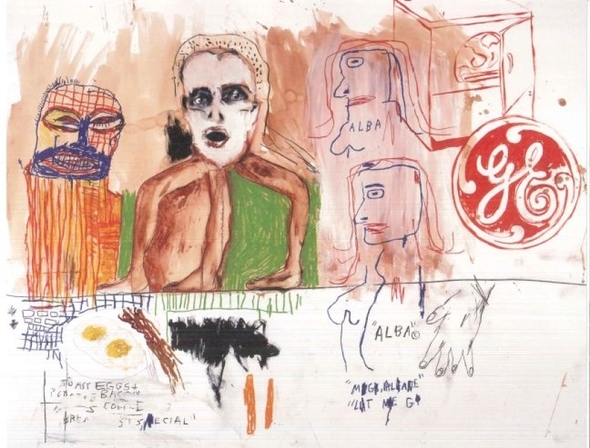 An Untitled drawing of Basquiat's from 1984, featuring cartoon-like outlines of a crowd of people was later blown up and silkscreened into the collaboration General Electric - White (listed below) - one of the many also featuring Warhol's painting of the GE logo. 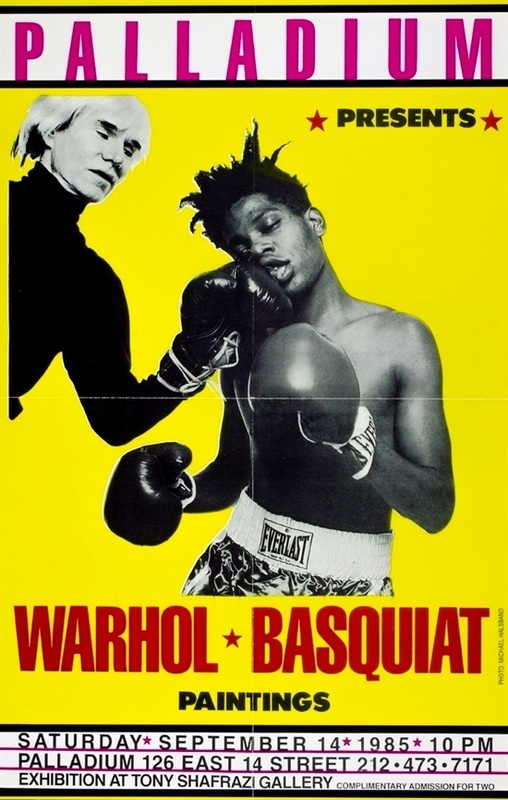 Only occasionally were the more expected roles of Warhol screen printing and Basquiat painting, such as the small canvas Collaboration (a Basquiat head painted over a Warhol silkscreen dollar sign), which may in fact have been Basquiat adding to a finished Warhol work after the older painters death. They made close to two hundred collaborative works, mostly between 1984 and the September 14, 1985 opening of the exhibition "Warhol & Basquiat: Paintings" at the Tony Shafrazi gallery in SoHo, New York. That show of 16 paintings first displayed their collaborative work to the public, and the initial negative reviews helped sour the relationship between Basquiat and Warhol. Basquiat was greatly saddened that he had not acted to repair the relationship by the time of Warhol's sudden death in February, 1987 at the age of 58. Basquiat's ongoing depression following Warhol's death is credited by many who know him as contributing to his increased drug use, and his own death in August 1988. The Andy Warhol Diaries are a huge and detailed, if gossipy, source. Compiled from daily telephone conversations with Pat Hacket, the edited 800 page version she published contains an amazing number of mentions of Basquiat. The fleeting daily recollections are nonetheless fascinating to anyone interested in the details, and chronology of their relationship. The entries devoted to Basquiat have been helpfully reprinted on the web by Damian Weber for quick reference. Despite the increasing superstar status of both artists after their deaths, it tool about a decade for a combination of Bischofberger's publicity, a few sympathetic critics, and the voracious hunger of the market for works by either artist to partially rehabilitate the reputation of these collaborative works.